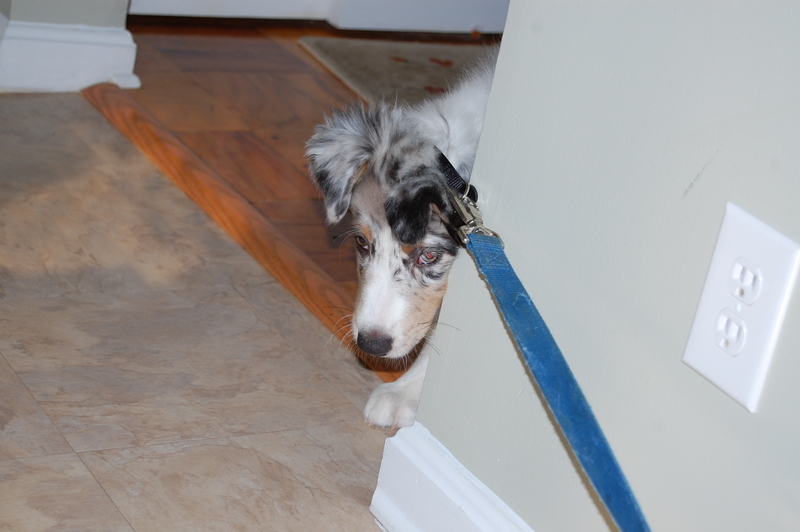 Today Gunny is learning that the leash does not follow him around. In other news, I have my very first red tomato in my happy little potted plant garden. I actually giggled, clapped my hands, and jumped with a tiny bit of joy when I saw it! I have been nursing that happy plant along. It smelled so good when I bought it. I was shopping at Lowe’s for good-smelling plants. I shop at Lowe’s because they give a ten percent military discount. There were not many good-smelling plants. It was late in the season to be starting a potted plant garden and most of the good stuff was gone. But I found a hearty little rosemary tree, a sad-looking oregano sprig, a strong sweet basil plant, some petunias, and the happy cherry tomato plant. I had no idea how delicious tomato plants smell. My mom hates tomatoes. Like totally hates them. I like them, but would not have thought to like the plant as much as I have. 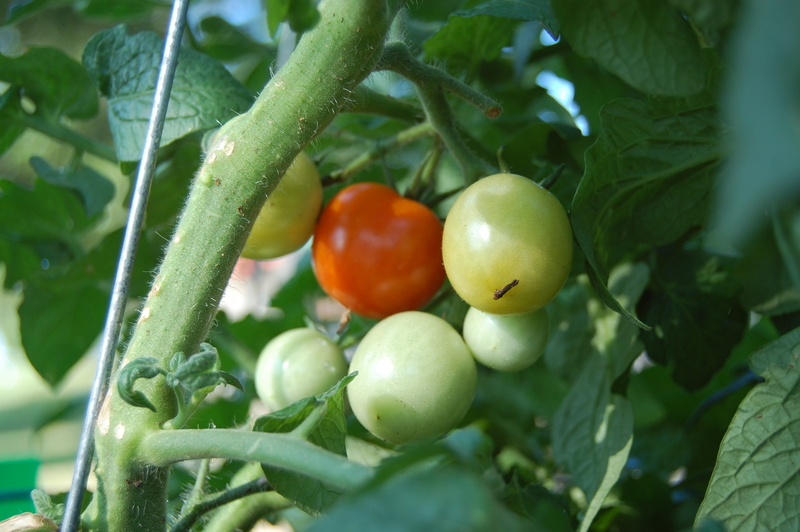 When I bought it there were two or three little berry-sized tomatoes on a couple of thin green branches. In the weeks since planting my potted plant garden, all the plants have just thrived! 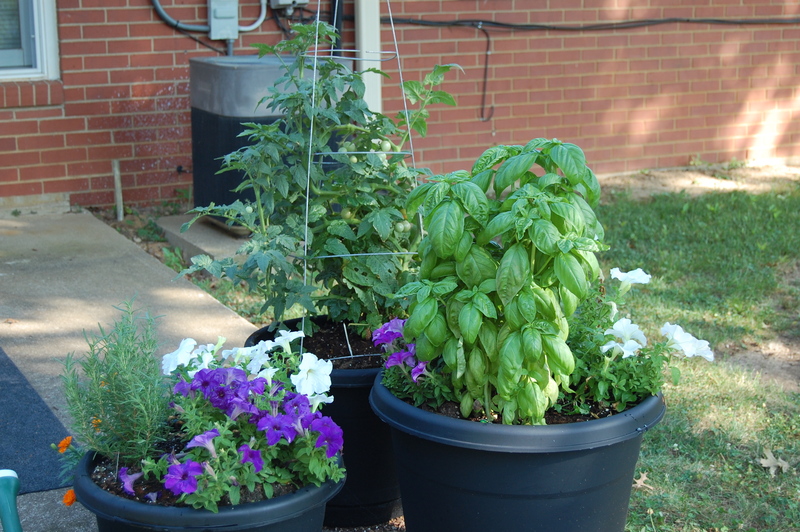 The basil looks like a forest, the petunias are crawling out to their pots, and the tomato required a tomato-stake-wire-cone-shaped-thingy join its personal pot. And now I have a cheerful little red tomato. Happy gardener. Gunny is used to the leash doing as he pleases. It is attached to his collar so he gets used to it. It serves as a tail, sort of. It also serves as a toy when Danger and Gunny are playing together. 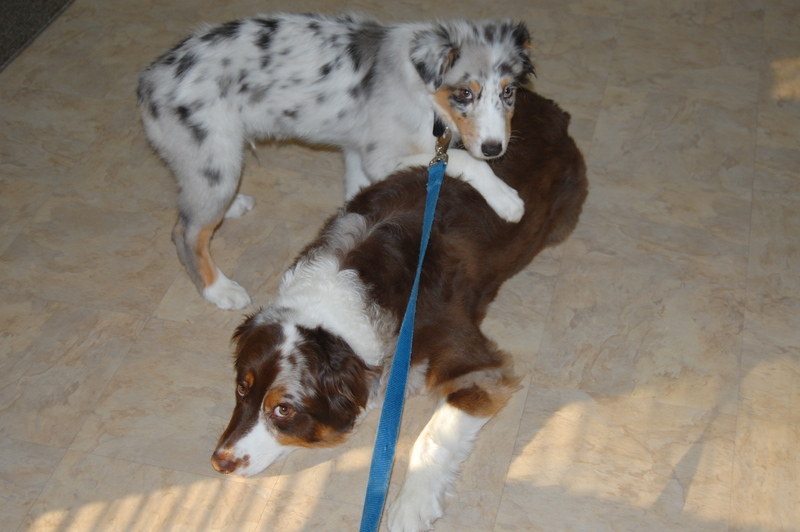 Once Gunny is good and riled up and Danger is done sitting on his head to keep him pinned down, Danger sits on the leash, and Gunny is up a creek without a paddle. It is very, VERY funny to watch. Tonight I cooked. Well, I cook every night. Dave and I are on a diet that gives us the opportunity to eat six times every day. Who would not love that? Tonight I had the absolutely delightful chance to twirl out to my little potted plant garden and harvest some herbs for my dinner concoction. Doesn’t it just look gourmet? Don’t you wish you were eating here with me? All this blog writing, cooking, and dog training inspired me to pull out a movie I love. 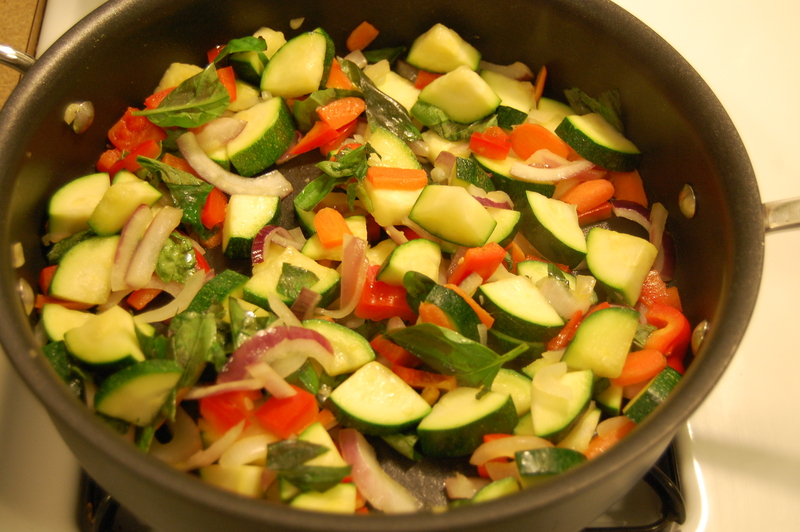 I am currently writing to you, bloggies, while Julie & Julia plays on our big screen tv. I love this movie. I’m sure most people love Merle Streep’s performance as Julia, but I honestly like Amy Adams’ Julie. There is a connection I have with her. That is probably a whole, long, other story. Maybe I should study psychology too. 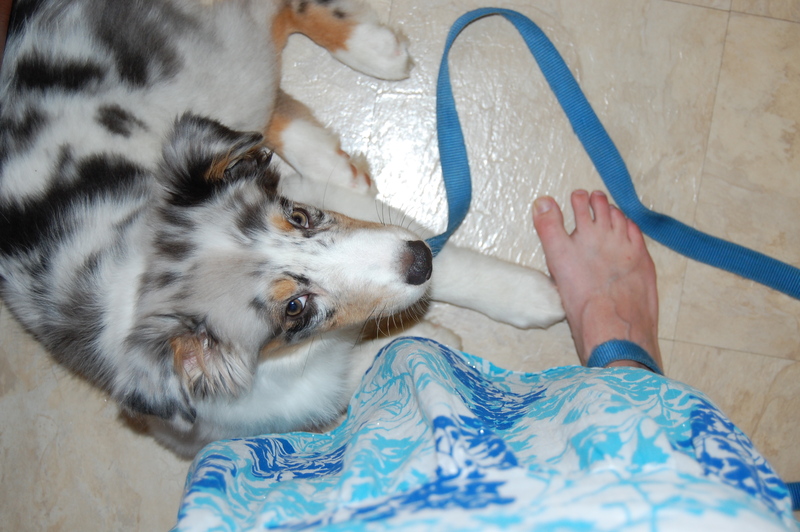 Gunny is not happy to be learning how to walk on a leash with me being in charge of where we are going. He rebels violently when I pull the leash. He bucks up and stares at the floor as though I am not there. Wanna see? He is a more nervous dog than Danger ever was, so I am training him differently. A lot more positive re-enforcement for my little Gunny. Tonight though, a little tough love. He had to go where I was going. Eventually he got the hang of it and I got everything done that was on my to do list, well almost. All with Mr. Precious strapped to my ankle.